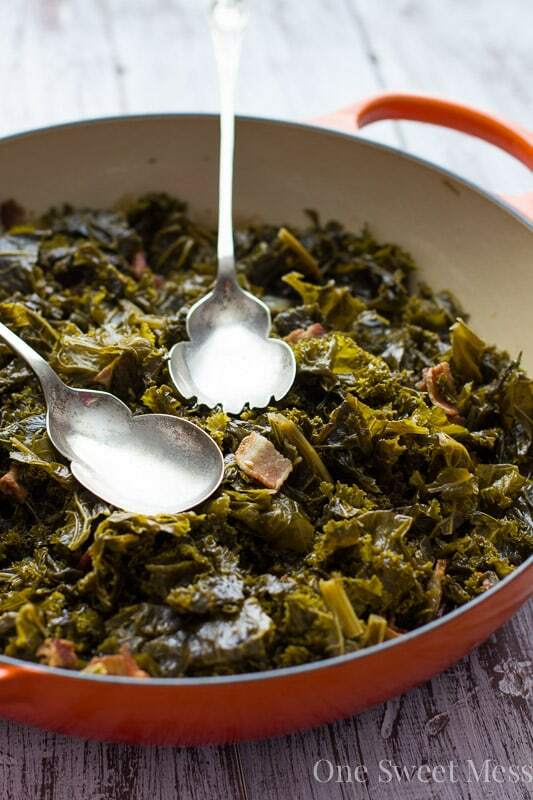 This Southern-Style Beer Braised Kale with Bacon is smoky, tangy, and slightly sweet. It’s the perfect side dish for a summer barbecue party or casual gathering. It’s best served alongside of everything and in abundance. It’s been 2 years since our trip to Charleston, and I still ache for the historic city. I keep telling Squirrel that we need to plan a trip back to picturesque town so I can try the many restaurants that I didn’t get to on our last trip. Charleston has so much to offer. It’s a great place to kick back and relax, but it’s also a great town to explore, take pictures, and soak up some southern charm. If you’re a history junkie, it has a lot to offer. The town is bursting at the seams with a rich narrative of past events, historic buildings, breath-taking churches, museums, and local art galleries. And, my favorite, food! Charleston is a foodie’s paradise. I started planning my food itinerary months in advance. Sifting through the long list of restaurants, cafes, and local dives was a challenge. I didn’t make it to everything on my list, but I’m proud to say that I was able to cross a majority of the places off my list. No matter what restaurant we visited, braised greens was always listed on the menu. I’ll never forget the first bite of greens. They were smoky, tangy, and slightly sweet–absolute perfection. After the first restaurant, I was determined to try greens from every restaurant we visited. When we returned home from our trip, the first thing I made was homemade greens. I was determined to perfect the recipe and maybe become a little less homesick for Charleston. This recipe for beer braised kale with bacon is the closest I’ve come to re-creating my favorite southern side dish (or meal, if you’re like me). I rendered the fat from some thick-cut bacon to create the smoky base for the greens. I used a combination of pale ale and chicken stock for the braising liquid. The greens take a good 3 hours on low to cook, but there’s not much effort involved and it’s definitely worth the little effort that does go in to making the dish. I chose kale for this dish since that’s what they had at my local farmers’ market last weekend, but you can also substitute collard greens. The greens cook up tender with a hint of tang from the addition of apple cider vinegar and slight sweetness from a sprinkling of sugar. Every bite reminds me of our trip to one of my favorite southern cities. This is the perfect summer side dish, and one of my favorites to serve with anything that comes off the grill and slathered with barbecue sauce. This recipe for beer braised kale cooks up tender with a hint of tangy sweetness and bold smoky flavor. Add the bacon to a large sauté pan. Cook over medium heat until the bacon is crispy, stirring as needed to prevent burning. Using a slotted spoon, transfer the bacon to a paper towel-lined plate, reserving 2 tablespoons of the bacon fat. Add the onion to the pan with the reserved bacon fat; cook, stirring often, until translucent and tender, about 4 minutes. Add the garlic and red pepper flakes to the pan and cook for an additional 30 seconds, stirring often to prevent the garlic from burning. Stir in the pale ale, chicken stock, and vinegar. Turn the heat down to low and add the chopped kale. It will appear as if there is too much kale to fit in the pan, but the kale will wilt down. Cover the pot and allow the mixture to cook for 2o minutes. Sprinkle the sugar, salt, and ground black pepper over the kale. Toss to combine. Stir in the bacon. Place the lid back on the pot and continue to cook for 2 and 1/2 hours. Check the greens every 30 minutes to make sure there’s enough braising liquid. If the braising liquid starts to get too low, add a little more chicken stock to the pan. When the kale is finished cooking, give it a taste for seasoning. Season with salt and pepper to taste. If you prefer your greens on the sweeter side, add a touch more sugar. You are so right – Charleston is a foodie’s paradise! I used to live there and loved trying all the restaurants, old faves and new ones too. And I love the flavor combo in this recipe! I’m so jealous that you had the opportunity to live in Charleston for a bit. Thank you so much for visiting, Lisa! This looks so good! They serve braised greens all over by us too! Time for me to make it at home! We’re heading to Charleston this fall for a wedding and I am beyond pumped! What brand of ale did you use in this recipe. Also, what is a bunch of kale. Hi Jackie! For this recipe, I used Blue Moon Summer Honey Wheat. My grocery store and local farmers’ market sells kale by the bunch (each bunch is banded with a rubber band), so I picked up two bunches for the recipe. It equals out to approximately 16-20 cups of chopped kale. Great recipe. It is our go-to whenever we cook ribs.